Károly Patkó’s so called “San Vito” (see reproduction below) wasn’t painted in San Vito (in my opinion) and nobody ever noticed? I am sure the painting’s title would have been corrected by now had anyone had a clue about the real location. This is the story of my artistic process today, combined with the story of finding the correct place of creation of a well known Hungarian painting. Above you can see my own rendering of the Italian village where in my opinion Károly Patkó actually painted his picture. You might think that I just grab my stylus and tablet, start ArtRage and begin to paint as if in a trans state. But that is not my process. I do a lot of research before I start sketching and painting. For example I research paintings, colors, styles, artistic periods and movements, artist bios, cities, villages, particular locations, spacial experiences and I compose my inspiration of the many impulses. I like to start painting when I can no longer wait to create because I so clearly see what I want to realize. During such a research process in 2015 I discovered a specific location of a Róbert Berény painting and I created my own rendering from another angle, plus I wrote about the process. I keep making other discoveries as well. For example I discovered purely visually where Tivadar Csontváry Kosztka created two of his paintings in Taormina (“Full Moon over Taormina” and “Blossoming Almonds in Taormina“), in spite of the fact that this location is not in the visible vicinity of the ruins of the ancient Greek theater (that he also depicted there). Explore the location of the paintings via: Google Street View… Sadly the amazing pink villa is gone and the blue building is in ruins… The picturesque vista that once was is forever lost, but we have two paintings to help us remember. 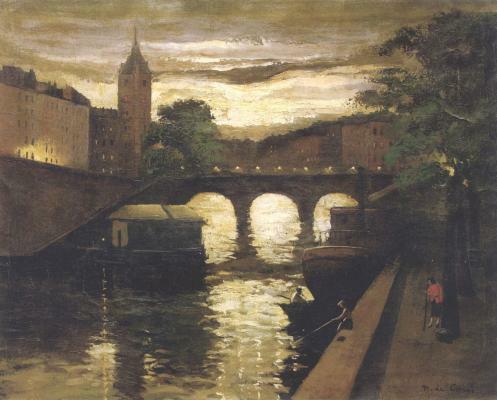 Recently I studied some Hungarian artists like Sándor Ziffer and Károly Patkó. After having noticed Ziffer in one of my paintings (I noticed his impact on my colors and atmosphere on my Roquebrune painting), I wanted to intentionally be inspired by Patkó, so I picked his “San Vito” painting. I looked at the particular “San Vito” via Google Street View (in fact I ended up looking at several places called San Vito) and I was surprised to realize that this Patkó painting has a clearly incorrect title. “San Vito” could not possibly depict San Vito! My motivation to paint this village only grew when I had this in mind: I am the only one in the world right now who could intentionally create a somewhat similar digital painting from a slightly different angle in my own style. This is a familiar and reoccurring opportunity in my life! (Remember Monaco and Róbert Berény? I was able to find the place and paint it from a different angle. It was so much fun!) I just started to paint and research inspirational locations recently. How many paintings have the wrong location, the wrong title or no known and specified location at all (that could be discovered)? Because I did not want to use the Patkó painting as my only visual input, and wanted to see the actual village, I kept searching for the real location. For some reason I was convinced that there should be a village that looks like the one on Patkó’s so called “San Vito”. Supposedly this has always been the title of the painting and that is really bizarre to me. Yet, there could be several explanations… for example Patkó used his own travel sketches to create his final tempera versions… it is possible that he himself gave the wrong title… hard to believe but possible… However, in many instances titles are given by other people once the artist is no longer alive… and art historians and art dealers are often superficial when coming up with a title… (eg. : in one case I could tell that a painting depicting a bridge in Paris with the title “sunset” was actually a “sunrise”… I just looked at it and knew instinctively that the title is wrong and it really was… I could show it on Google Street View within minutes). How did I find the correct location of Patkó’s painting? Next (based on the spacial experience on the Patkó painting, plus based on former travels and online research) I decided that while San Vito is at the Adriatic Sea, the place I am looking for must be on the Tyrrhenian Sea shore. I looked at several villages there, but I could not find it immediately. There were some similar places, but I knew that I had to keep searching. I decided to stop looking at Google Earth and Street View for a while and went back to my usual inspirational Google Image search for the area to find the next best place to paint until I find the location of the Patkó painting. And interestingly that is when I stumbled upon a photo of Atrani on the Amalfi coast. And I knew immediately that I discovered the village where Patkó actually painted his “San Vito”! The aerial image was small, but the spacial structure was obvious. The correct title should be “Atrani“… or “The Valley of the Dragon“. You might assume that it is easy to come up with the right title of a painting, but that is also not the case. I spent hours finalizing the title… from the simple location name to the more magical one to the totally philosophical I had half a dozen different titles. At one point I called it: “Possibilism and Eternalism in Atrani”. And with that title I came up with a name for my own artistic movement: Possibilism. It exists as a cultural, human geographical terminology and basically covers the fact that geography is only a minimal limitation for cultural development. Cultural development is mainly determined by social conditions. When I transformed Possibilism into an artistic terminology I added the ever evolving internet and technology… plus I extended this terminology to geographically unlimited artistic creation (no matter where you are, you have the means to be anywhere online) and phenomenally flexible cultural evolution (you have the option of internalizing and even influencing another culture without being in that particular cultural or social environment). I researched the village online. Initially the building on the Atrani beach was higher than the road, but the third floor was demolished after a while and in the 1950s the road was broadened and so the road is now literally above the beach building. While Csontváry’s beautiful pink villa in Taormina did not survive (and that made me very upset), Patkó’s beach house at Atrani is still there, even if a bit smaller and partly covered by the road. I remember how happy I was to see that in hyper developed Monaco the houses that Berény depicted were almost perfectly preserved in the harbor. Just the same, I am glad that the good people of Atrani maintained the beauty and authenticity of their village. This is where Eternalism joins Possibilism… Me culturally enhancing the story of Atrani from my living room couch (in another country) and also enhancing my own cultural heritage (Possibilism of the internet age) combined with the philosophical assumption that my digital painting’s possibility existed eternally in Atrani and only apparently came into being during the last couple of days (at least the possibility has always been there and only now do we recognize the manifestation … the same way the possibility of Patkó’s painting has always existed… think of a caveman sitting in front of a cave… that creature at the campfire cluelessly poked the building blocks of a futuristic society with a stick… the possibility of everything that exists today already existed within and without… the same way today we walk around knee-deep in yet unrecognized possibilities… for example we could ensure a dignified life to every human being alive, this is only a matter of joint mental effort, because the resources are there… the smartest individuals are however still trying to figure out how to enlighten all people about this and make the obvious possibility manifest itself as our everyday reality… clearly almost everything is dependent on our joint imagination… so, possibilities are not dependent on time, possibilities are apparently eternal, a time sequence is only relevant to the manifestation of the eternal possibilities… while space itself does not appear to be changing much during humanity’s existence… I could almost touch Patkó’s shoulder in Atrani while he is drawing, even though I did not exist yet when he was already dead… this is how I conceptualize my artistic Eternalism. When you notice a possibility and act upon it, you become the channel of manifestation of something eternally possible… ). But why don’t I stop driving the less philosophically inclined readers mad right here and right now…? If you compare Patkó’s painting with the real place (Atrani), you will notice that he changed the composition by eliminating the middle section of the residential layer… he virtually pushed some of the buildings from the left to the right to place them in the middle. He turned a broad landscape view into a tall portrait view. I think he did these because he found the series of arches on the left more interesting and wanted to make the middle section architecturally more homogeneous with the buildings on the right side. The mountain tops never looked like that in reality, he probably improvised, but the agricultural terraces above the buildings are correct. 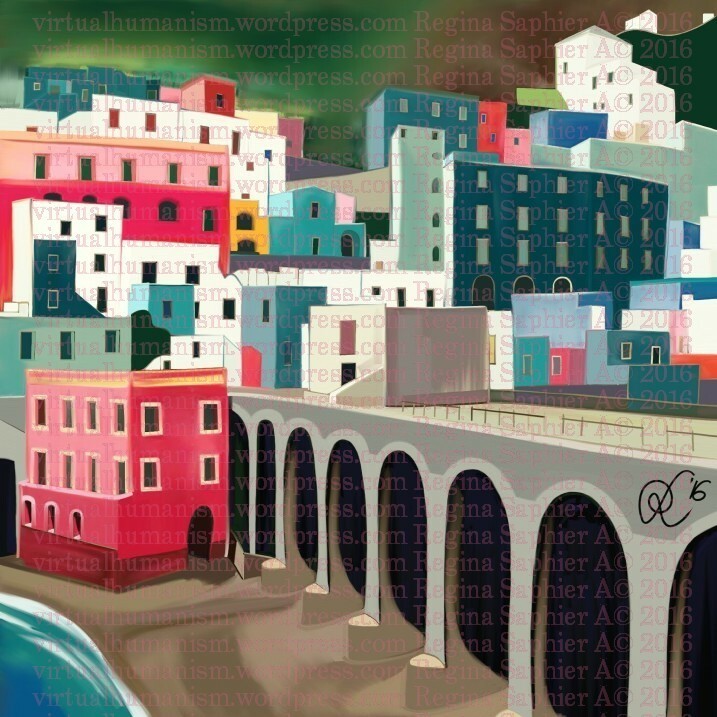 I am not sure about the colors of Atrani in 1931, but Patkó mainly opted for blues, greens, white and brownish colors… However, in this region blues and greens are less common on buildings. His version is in many ways removed from reality and yet the village is perfectly recognizable. While sketching Atrani he was standing above the viaduct, at or under the Collegiate Church of St. Mary Magdalene. Artists influence each another and remember each other. 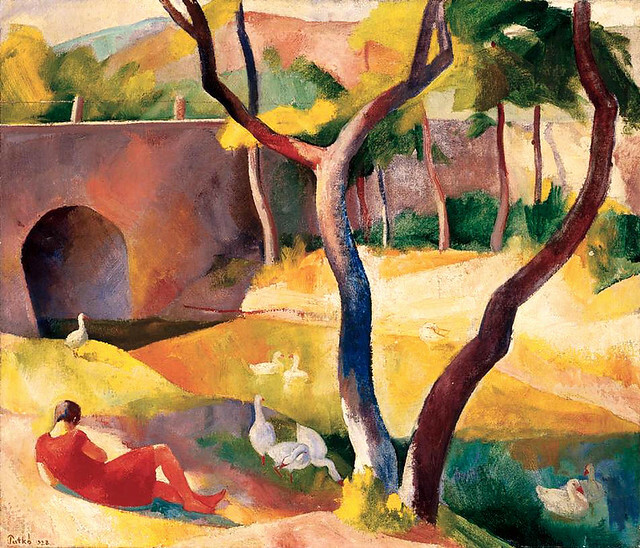 I happily discovered how Derain’s L’Estaque painting impacted Patkó’s art… so, I disagree that his art was mostly inspired by the Italian tradition… Cézanne and Derain were definitely among his role models. In my opinion this is not the only painting where he remembers André Derain’s The Turning Road in L’Estaque. 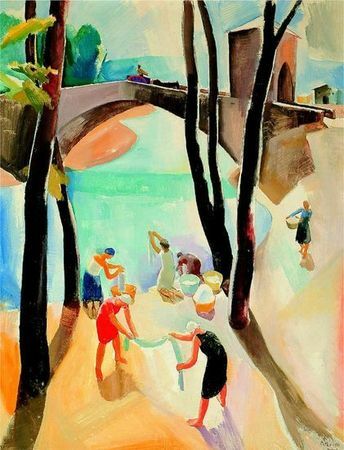 Here are two other Patkó paintings that remind me of Derain: “Goose Girl by the Brook” and one of the “Subiaco” versions: women are washing clothes under a bridge and a coach driver is crossing the bridge. Are we a 100% sure that Károly Patkó never went to L’Estaque? Alternatively: Where did he paint the “Goose Girl by the Brook” in 1928? His 1926 “Still Life with Apples” was clearly inspired by Cézanne… Of course one does not have to go to a particular place in France to be inspired by it… I know that. Patkó could have painted this canvas anywhere… even at Lake Balaton… based on a reproduction of Derain’s canvas. Anything is possible. In his book (and in his two part BBC series) David Hockney talks about how old masters like Caravaggio used the Camera Obscura, concave mirrors and lenses when sketching and painting. There were trade secrets that made the artistic process more precise and faster. According to Hockney’s research concave mirrors were used as early as 1420… the artist worked in a Dark Room (Camera Obscura), while the model sat in strong sunlight outside of the Dark Room… Caravaggio apparently switched from the concave mirror to the more advanced lens in 1595… and in 1839 photography was invented. That means that between 1420 and 1839 artists gradually and secretly transitioned from freehand sketching to freehand tracing, and after 1839 artists regressed back to freehand sketching and painting that were the norm before 1420. Those who used concave mirrors and lenses were skilled artists, even appeared to be amazing magicians to less insightful people, and were most definitely shrewd businessman, deploying every possible contemporary technology to create the most lifelike and exciting images while optimizing their working conditions and maximizing their profits. Artists returned to the methods of the pre-mirror time period again as a reaction to the invention of photography. Today, in the age of digital photography, virtual reality, artificial intelligence and robotics, the task of the artist is no longer the creation of a lifelike visual experience, rather the task is eg. : the visual representation of human emotions. Impression, expression, fauvism, playing with light, color, atmosphere and space. In this age it is also absolutely self evident that more and more people are painting with digital tools. The intelligent and creative artist is open to every possible new tool his or her era has to offer. It is not the mirror, not the lens and not the digital tool that creates movements and marks. The artist’s personal and spontaneous neurology is what creates art in a larger social and cultural context, while channeling a universal and endless stream of possibilities. My comparison of the two (I flipped the Patkó painting and added a section of the Derain painting on the right). Homage from artist to artist… a natural instinct that goes on forever. In many cases you don’t have to go to a particular location “to feel” or “to see” the place, especially today! However, the way I see it, the famous location of Derain’s fauvist painting is lost, just like Csontváry’s pink villa… these places live on in sensitive people’s unique art. Atrani (in the valley of the River Dragon) is a particularly lucky village that mostly maintained its original charme and is also enriched by artistic creativity. As of today I am suggesting a new title and a new location for Károly Patkó’s “San Vito” painting. It should be called: “Atrani“.